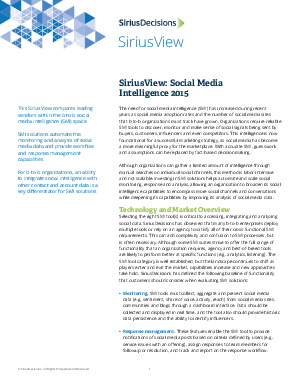 The need for social media intelligence (SMI) has increased during recent years as social media adoption rates and the number of social media sites that b-to-b organizations must track have grown. Organizations require reliable SMI tools to discover, monitor and make sense of social signals being sent by buyers, customers, influencers and even competitors. This intelligence is now foundational for a successful marketing strategy, as social media has become a more meaningful proxy for the marketplace. With accurate SMI, guesswork and assumptions can be replaced by fact-based decisionmaking.